Ropeways are often located in a high-alpine terrain. In this environment wind and weather may claim the operating material a lot. Already during installation of the ropeway these construction sites in rough terrain are often complex and equipment can get lost very fast. Furthermore several construction sites often have to be coordinated simultaneous and equipped with operating material. That makes a modern operating material management almost impossible. Unsafe equipments threaten the safety of the employees and can cause accidents. With the assistance of Integrated Services such problems are a thing of the past. Ropeway installation is project business. 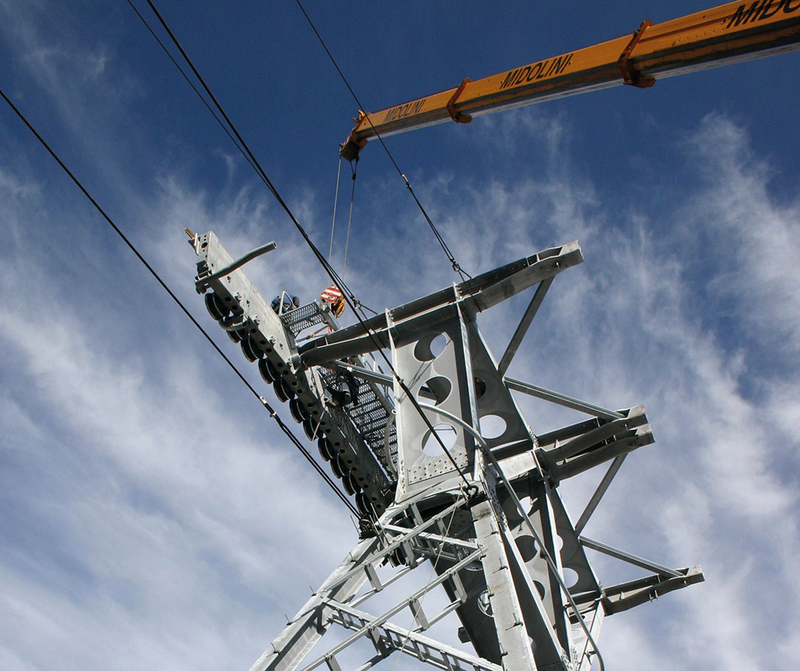 During installation of a ropeway all work processes must run smoothly so that the tight timetable can be met. Because delays cost a lot of money. Therefore it is more important, that all used equipments are always available and ready to use. The operational capability is based among other things on the annual required inspection and the appropriate use. For many companies which operate in project business and have several construction sites simultaneous it is often difficult or impossible, to get an overview about all equipments and match them to the specific project or the construction site. 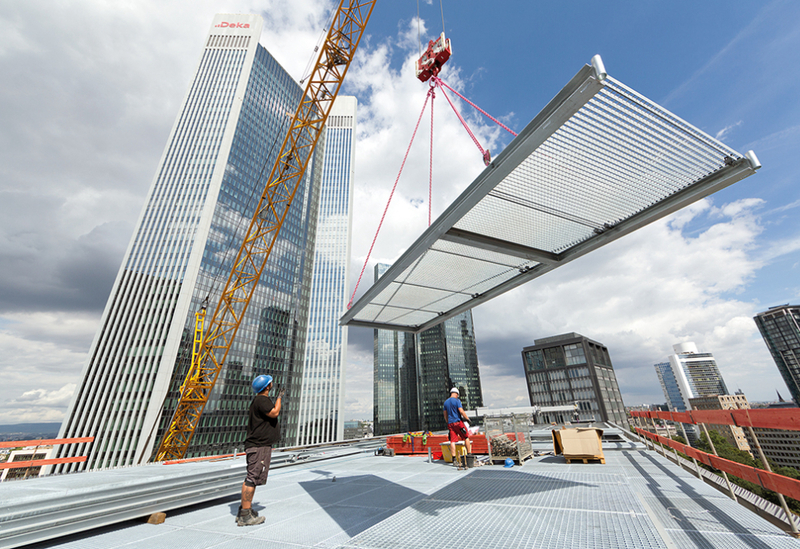 Because operating material can move unintented from one construction site to another. Due to sometimes simultaneous operating project construction sites smaller parts like tools or lifting equipment are exchanged and not assignable any more. Or they are long overdue for maintenance and therefore no longer safe. A use of such operating material can cause delays on the construction site. As a last resort accidents can happen. 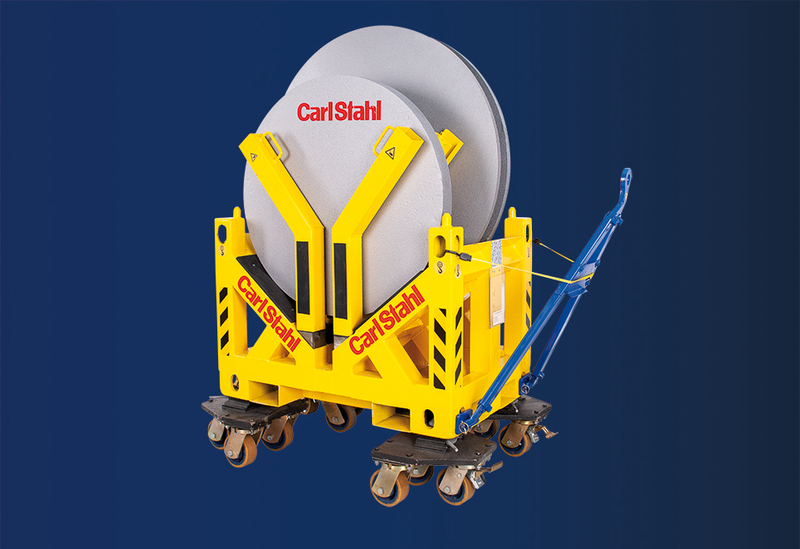 Carl Stahl’s Integrated Services offers the perfect solution. All operating material is marked at the initial reception during the annual inspection by our service technicians or for new products on a customer request before shipment, either with a weather-resistant bar code or with the UV-resistant identification tag „Chipster“. With the multifunctional reading device „Scenter“ subsequently the bar code or rather the ID of the Chipster (RFID-identification tag) is read out and transferred into a service portal where it is permanent and error-free combined with the product information. Therefore the operating material is clearly identified. Our service technician now inspects the equipment based on a checklist which includes information from the manufacturer, all legal requirements and customer specific inspection criteria. If the equipment has no objections he gives his ok and the legally watertight inspection result is saved in the Integrated Services portal. That is important for the operator to meet the documenation obligation. If the equipment has objections, it has to be taken out of service, be repaired if necessary and then put back into service. Authorized people have access to the Integrated Services portal, whose data are in a secured cloud database, at any time. Even from a web-enabled device like computers, notebooks, tablets or smartphones. Thanks to its easy handling authorized people can independently manage data and if necessary complete them. Once recorded, the product data lighten future operating material inspections significantly. That reduces costs. Completed with additional information of the individual equipment like responsibilities, product images or application videos, product history or important inspection cycles, it offers the purchase department for example at the push of a button an overview about all equipment of a company and its status. That makes replacement faster and easier. 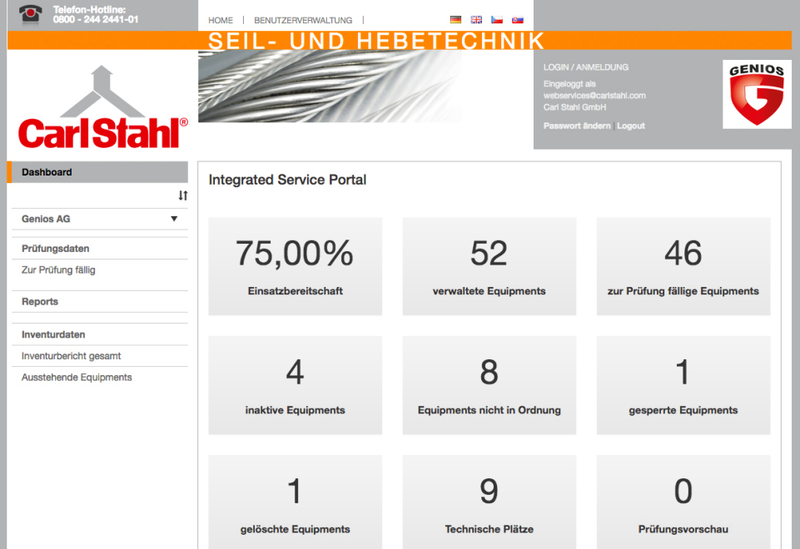 Thanks to the service portal the employees in the head quarter of the ropeway company or the employees at the construction site are able at any time to identify, what equipment is currently assigned to that construction site. 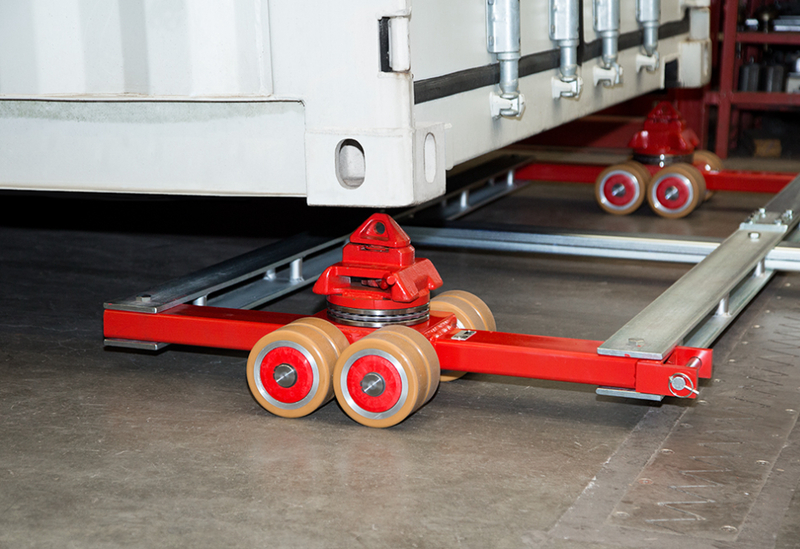 If a equipment has a short-term malfunction, a replacement can be immediately done due to the stored product data. That reduces downtimes. Thanks to the mapping of the equipment to the respective project total costs of a construction project can be determined much faster. If the cable car station is installed, of course all therein located equipment which is not delivered from Carl Stahl can be marked, inspected and saved and managed in the service portal. That can be for example extinguishers, all factory equipment, the entire car fleet or electrical devices like drilling machines. Simply all equipment, which have to be inspected annually. It is possible with the stored inspection dates, to plan in advance future necessary inspections and therfore reduce downtimes to a minimum. Damage analysis in combination with the product history show at a glance, if an equipment is well dimensioned and suited for its use. User trainings raise the awareness for a correct use with the equipment and finally ensure more safety. 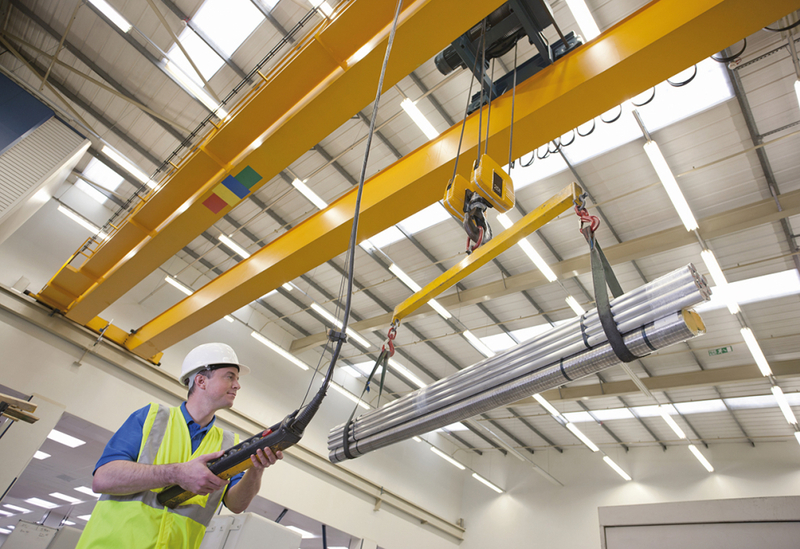 Ropeways have to be inspected regularly to work smoothly. During these important inspections enough space for the technicians to get access to the engines, transmissions, rope sheaves and many other details must be given. 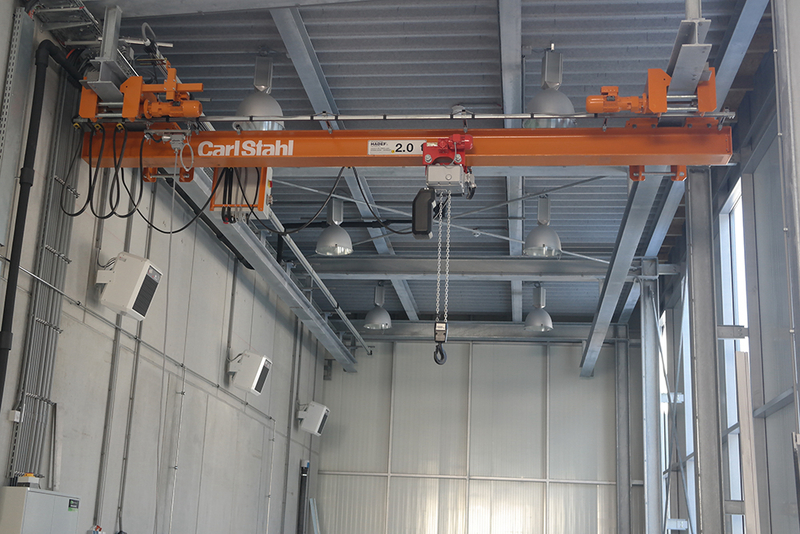 Because of that in the lower-, middle- and top-station of the new 3S Eisgrat ropeway modern crane systems and load suspension equipment from Carl Stahl was installed. This equipment supports the technicians during the inspections and eases their work. All products are not „just from stock“ but customer specific special solutions. Alle Produkte sind keine Stangenware sondern kundenspezifisch gefertigte Sonderlösungen. In fact planned and manufactured in Germany. 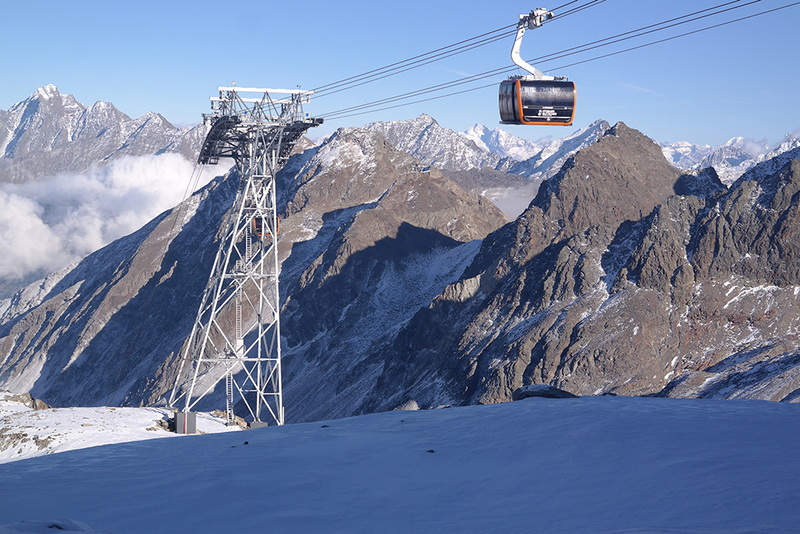 Modern crane system and load suspension equipment from Carl Stahl in the new 3S Eisgrat ropeway in the Stubai valley (Austria).